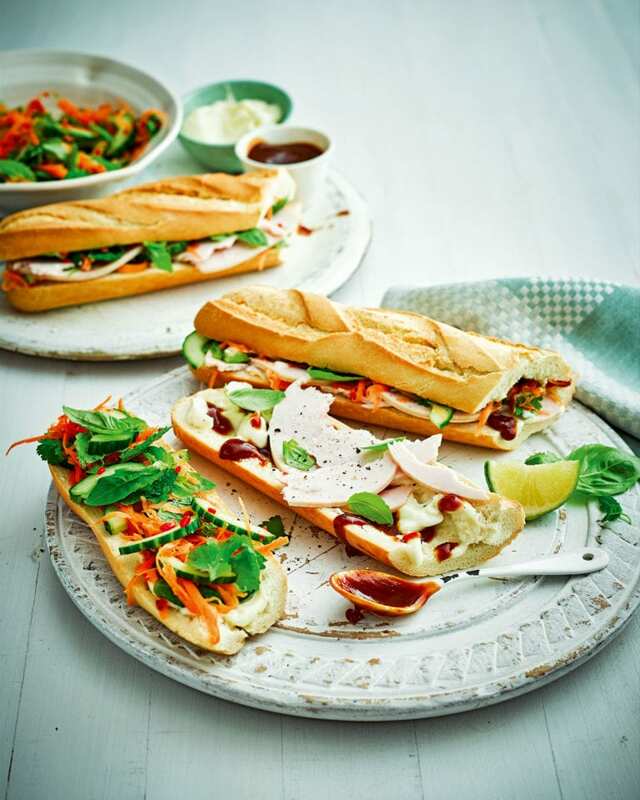 This Vietnamese twist on a classic turkey sandwich is ready in 15 minutes, budget-friendly and makes the perfect lunchbox filler. In a glass or ceramic bowl, mix together the carrots, cucumber, vinegar, lime zest and juice, fresh chilli and herbs. Set aside. Cut the baguette into quarters, then slice each quarter in half horizontally. Remove the soft bread inside (see tips) leaving a cavity for the sandwich filling. Spread one half of each sandwich with 1 tbsp mayo and the other with 1 tbsp plum or hoisin sauce. Pile on turkey and pickled veg, shaking off most of the pickling liquid, then sandwich together. Wrap in cling film and chill until ready to eat. Use the leftover bread to make breadcrumbs. Freeze, then defrost to use as a topping for baked fish. Make and chill the sandwich in the morning to eat at lunchtime – the flavour will be even better.